Behold, the otamatone! To play this very cute instrument, you have to use two hands. While pressing on the touchpad on the handle, you have to squeeze the cheeks of the head so that the mouth will open and a high pitched or bass sound will be played through the small speaker inside the head. The notes start with Do from the top. You do have to press on the cheeks or there will be no sound at all. I find this ingenious and adorable at the same time. 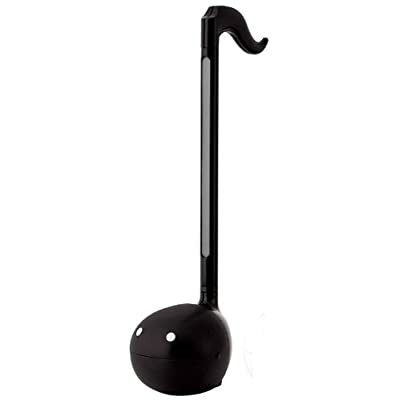 And today for the first time, I have looked at the price through amazon.com, and the price of this black otamatone is *drumroll please* – only 35.95$! I was expecting it to be over 70$ so I guess this is pretty decent. There are a lot of different versions of the otamatone, the black one being my favorite. There is also a white version, and another version with a face consisting of teeth (the black one has a silver colored handle while the white one has a gold colored one). You could purchase one from this link. Anyway, you could play with them for free (once you pay for the museum ticket) as long as you want on the fifth floor of the museum. The exhibition will continue until the 3rd of October, so be sure to pay a visit before it’s over. So what happened to çubuk? Remember Çubuk from a few months backwards, the fictional fast-food Chinese Restaurant for which I was designing the corporate identity for? The last time I posted anything regarding Çubuk was this, and now at a glance, I could say that is absolutely hideous. The image of the menu that I designed this term will be coming up soon. Credits go to Murat Durusoy and Emre Parlak for the photography. By the by, this is my 150th post. Huzzah! I haven’t been online for awhile. I am in London!!! It’s so exciting because I can get to see my dear friend Iris (she says meow) whom I met during a Buddhist university chinese summer camp which included a lot of sports, language classes, “voluntary” work, and the lousy dorm where we were roommates with cockroaches. And of course, to see London – a lot of paintings, sculptures, buildings, clock towers, bridges etc etc to die for! Sooo. I’ve been to the British Museum, Madame Tussauds, the National Gallery, the National Portrait Gallery, the Royal Academy of Arts (where they have a very interesting exhibition at the moment – the Real Van Gogh: the Artist and his letters), the Houses of Parliament (and Big Ben), Trafalgar Square, Buckingham Palace, the Chinatown at Leicester Square (like 3 times – Asian food! ), London Zoo, the Aquarium, Harrods.. I love London so far and I find the metro/subway – which they call the tube (officially Underground) very amusing. I will update with more photos I took when I go back home, which will be like after the 9th of February.